One part of your ceremony that you don’t want to miss out on is the blessing of the marriage. Be sure to fully recognize what it is and what it means as well. It’s important that you incorporate it into your big day for a variety of reasons, you just have to decide how you want to go about it and what fits your couple style. But don’t worry, we’re here to help! 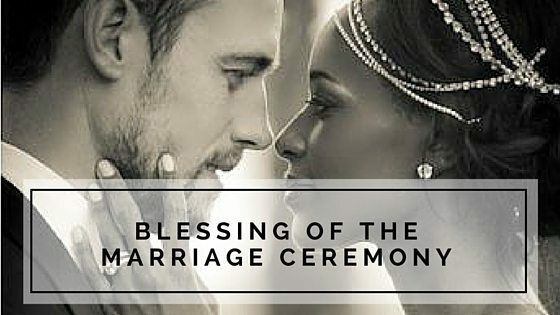 What Is A “Blessing Of The Marriage” Ceremony? The ceremony to bless the marriage is an important one but where does it come from? And how does it coincide with your religious and cultural beliefs? Traditionally, the essence of marriage is the mutual agreement between a man and a woman for a lifelong union, voluntarily assumed, and publicly acknowledged. The Church, in providing a fitting setting and a beautiful ceremony for its announcement and public ratification, does all in its power to safeguard the union and to make of it what a marriage ought to be. Marriage as a social institution is as old as the human race. It was “instituted of God” in the Garden of Eden (Gen. 1:27–28; 2:18, 24) and obviously is not of Christian origin. It belongs to all mankind… to Jew, Gentile and Christian alike. The mutual contract between bride and groom can be acknowledged and publicly ratified before a Justice of the Peace or other officers of the State; but such a marriage, though legal, lacks a very definite “something” which a religious service gives it. That “something” is the blessing of the Church, and it gives the newly married couple a deeper understanding of God’s wish for them. The Rite begins as prescribed for celebrations of the Holy Eucharist, using the Collect and Lessons appointed in the Marriage service. And [name], you have come here today to seek the blessing of God and of his Church upon your marriage. I require, therefore, that you promise, with the help of God, to fulfill the obligations which Christian Marriage demands. [Name], you have taken [name] to be your wife. Do you promise to love her, comfort her, honor and keep her, in sickness and in health; and, forsaking all others, to be faithful to her as long as you both shall live? The Husband answers I do. [Name], you have taken [name] to be your husband. Do you promise to love him, comfort him, honor and keep him, in sickness and in health; and, forsaking all others, to be faithful to him as long as you both shall live? The Wife answers I do. Will you who have witnessed these promises do all in your power to uphold these two persons in their marriage? When piecing together your perfect wedding ceremony, it’s important to think about the readings and vows that follow. Here we have some examples of how you can focus on the blessing of the marriage and have it fall in line with your Godly beliefs. If there is to be a Communion, a passage from the Gospel always concludes the Readings. The Holy Gospel of our Lord Jesus Christ according to ______. In the presence and Name of God, I, [name], take you, [name], to be my wife, to have and to hold from this day forward, for better for worse, for richer for poorer, in sickness and in health, to love and to cherish, until we are parted by death. This is my solemn vow. In the presence and Name of God, I, [name], take you, [name], to be my husband, to have and to hold from this day forward, for better for worse, for richer for poorer, in sickness and in health, to love and to cherish, until we are parted by death. This is my solemn vow. Bless, O Lord, this ring (these rings) given as a sign of the vows by which this man and this woman have bound themselves to each other; through Jesus Christ our Lord. Amen. Now that [name] and [name] have exchanged these solemn vows, with the joining of hands and the blessing of a ring, I pronounce their marriage blessed, in the Name of the Father, and of the Son, and of the Holy Spirit. “Remember that your love is the basis for this marriage; desire nothing else, fear nothing else and allow your love to blossom into what love was meant to be. “May you be blessed by God. “Aware now that there is one Presence and Power, and that we are each part of that Divine unity, we now join in blessing BRIDE and GROOM as they begin their lives together.